Lately, my 15-year old daughter has been on a “self-help” phase, fueled by tons of website showing clickbait titles like “4 simple ways to memorize anything” or “Try this to have fuller eyelashes.” That has interested in her in other tricks or “hacks” to achieve new things. My daughter and I share a lot of things including what others think is an odd sense of humor. However, I don’t play soccer and she doesn’t like to go on my daily bike rides. It’s been hard to find overlapping exercise routines, other than tennis which we only play when on vacation. She’s in 9th grade and part of the curriculum is a mandatory conditioning class. Not “gym,” but “conditioning,” which I guess is more geared toward understanding how to eat and exercise rather than how to feel clumsy around your peers. This class has made her want to be in better shape. Today, she was doing jump rope. Tomorrow, she may actually go on that run she has been promising to do with her mother. But starting 3 days ago, she and I have been following an online schedule to achieve 100 push-ups. This may seem like a crazy objective to some but I’ve tried it, and with some perseverance, it’s amazing how quickly you can make massive progress. You can find an excellent and free routine at hundred pushups.com. I’m sure they are selling something but they don’t try to grab your email so you’re free to see all the content without getting snagged into a newsletter. 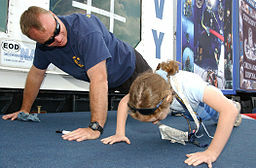 A 40-year old dad should be able to do 27 push-ups. If you can do that many, you start the program with a head-start. What I like about this is that for a dad/daughter (or dad/son) project, the objectives are both doable and long term. After a quick push-up test, you’re given a starting routine with your 100 push-ups a day objective off in the distance, 6 weeks away. Each push-up session, every other day, only takes about 10 minutes, which is relatively is easy to schedule. 4. At the end, it has a positive benefit and if you keep at it, you’ll be able to do 100 push-ups per day for the rest of your life, an exercise the New York Times says is “the ultimate barometer of fitness.” I can feel my stomach getting tauter, my biceps bigger, my chest expanding, and it’s all going quickly to my head. We’re only three days but already we’re reminding each other that “it’s time to do the push-ups” and rather than a unpleasant grind for both of us, we’re both kind of looking forward to it each day. And isn’t that the kind of thing we’re all searching for all the time in activities to do with our kids?